Curved lifts are custom-fit to your stairs for a smooth ride with no need to transfer at landings. Does your home have a curved staircase? This common architectural feature can save space and even make a home more attractive – but it can also present an accessibility challenge. However, curved stair lifts from Bruno can be custom-fit to any curved staircase, so you can access your whole home with ease. The latest-edition custom curved stair lift by Bruno is the Freedom Lift III. This slim, attractive design provides a smooth and reliable glide up the stairs. 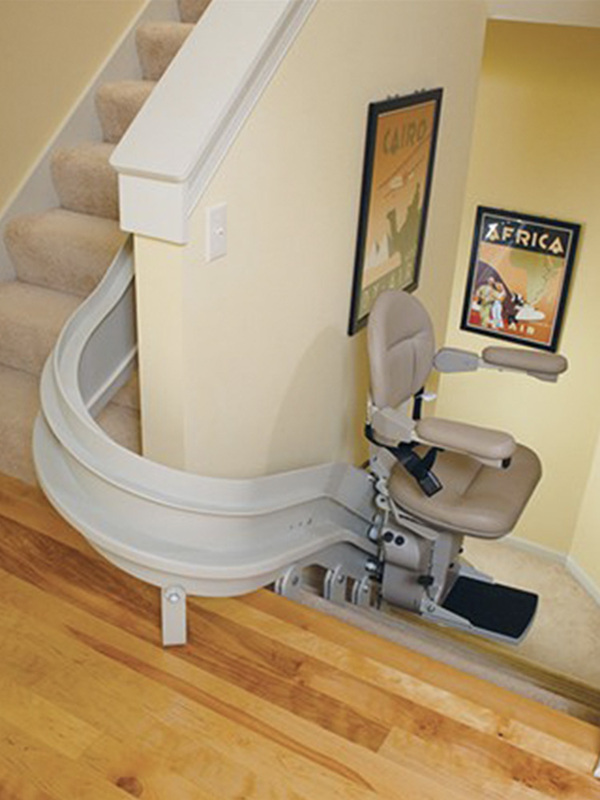 The Freedom Lift III is custom-fit to your stairs, eliminating the need to transfer from one lift to another. Handcrafted in the USA with a lifetime warranty on the drivetrain, the Freedom Lift III offers both accessibility and peace of mind. When you contact Freedom Lifts, you can have the Bruno Freedom Lift III professionally installed – and sooner than you’d expect! In fact, no company can provide a custom curved lift faster than Freedom Lifts. Enjoy being outside again with our stair lift model specifically designed for exterior use. The Elite Outdoor Curved provides the same quality, comfort, and convenience as their interior stair lift models combined with the durability to stand up to the elements. The rail design provides a remarkably stable ride from top to bottom, while the visual coded diagnostics give you instant information on the unit’s status. Enjoy the dependability and style that only a Bruno stair lift can give! No matter the shape of your stairs, we have an affordable solution for you!